ARC invites you to support the initiatives we’ve listed for the new Federal Government by joining our postcard action. For the pictures, the names of 1155 women and children murdered as a result of intimate femicide just over the past 15 years were merged from lists of Indigenous women across Canada and women murdered in Ontario alone. Many more women could be added to this list if it were complete, but these names alone wouldn’t fit into a large room. 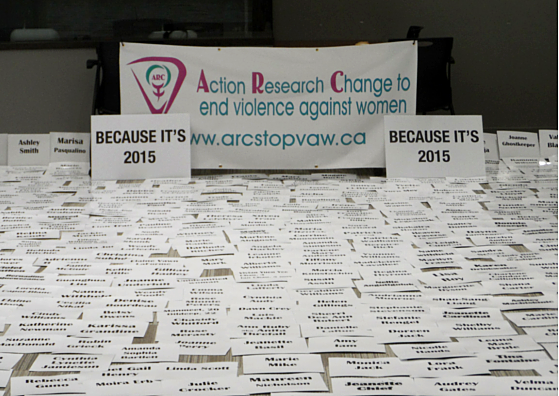 We honour all of these women and ask for federal action to address violence against all women. 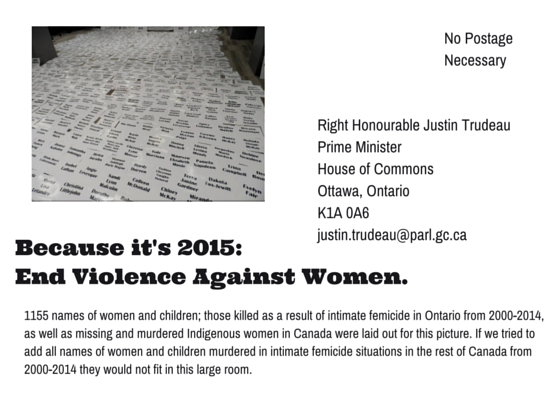 Download our pdf or copy our post card and mail it to Prime Minister Justin Trudeau at the House of Commons. No postage is needed to mail to the House of Commons. Survivors, advocates and activists working for change to stop violence against women.